David Kaplan and Jordan Cornette talk with Frank Thomas and Tom Haberstroh. David Kaplan and Jordan Cornette talk with Jesse Rogers and Dan Orlovsky. David Kaplan and Jordan Cornette play Shot or No Shot. David Kaplan and Pat Boyle listen back to Anthony Rizzo and John Fox. David Kaplan and Pat Boyle talk with John Fox and they play Shot or No Shot. David Kaplan and Pat Boyle talk with Cubs first baseman Anthony Rizzo. David Kaplan talks with Ryan Hollins about the NBA playoffs. He also plays Shot or No Shot. David Kaplan talks with Dan Wiederer and Sahadev Sharma. David Kaplan talks with Steve Stone. Kap gets a Cubs update from Jesse Rogers. Then Brian Windhorst calls in to talk NBA Playoffs and his Lebron book. 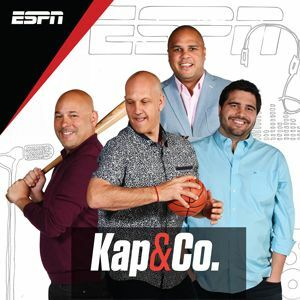 Kap is joined by Dan Plesac to discuss Baseball's unwritten rules, and then Carmen joins to play Shot or No Shot. David Kaplan talks with Dan Wiederer. David Kaplan and Pat Boyle talk with Jason Benetti and Nick Friedell. David Kaplan and Pat Boyle talk with Steve Dahl, Jeff Passan and Kevin Matthews. David Kaplan and Pat Boyle talk with Jesse Rogers. David Kaplan and Jordan Cornette talk with Porter Moser Loyola head coach. David Kaplan and Jordan Cornette talk with Stan Van Gundy and Cubs first baseman Anthony Rizzo. David Kaplan and Jordan Cornette talk with Jesse Rogers. David Kaplan and Jordan Cornette talk with Jeff Dickerson and Todd Hollandsworth. David Kaplan and Jordan Cornette talk with Jesse Rogers about Yu Darvish's win last night in Miami. David Kaplan and Pat Boyle talk with Tom Rinaldi and Jesse Rogers. David Kaplan and Pat Boyle talk with Andy North and Todd McShay. David Kaplan and Pat Boyle talk with Marty Smith. They talk about Tiger Woods winning The Masters. David Kaplan preview's the NBA Playoffs with Chris Bleck. David Kaplan talks with Jesse Rogers and Frank Isola. They also play Shot or No Shot. David Kaplan talks with Tom Thibodeau. David Kaplan and Pat Boyle talk with Mike Greenberg. David Kaplan and Pat Boyle talk with Jesse Rogers and Florida Panthers head coach Joel Quenneville. David Kaplan and Pat Boyle talk with Gene Wojciechowski live from The Masters. They talk about the Cubs loss last night and Yu Darvish. David Kaplan and Pat Boyle talk with Frank Thomas, Vincent Goodwill and Jesse Rogers. David Kaplan and Pat Boyle talk with Cubs first baseman Anthony Rizzo about the home opener, Kris Bryant and the team's identity this season. David Kaplan and Pat Boyle talk with Cubs first baseman Anthony Rizzo. They also play Shot or No Shot. David Kaplan and Pat Boyle talk with Andy North. David Kaplan and Jordan Cornette talk with Seth Greenberg. David Kaplan and Jordan Cornette talk with Chris "Mad Dog" Russo and play Shot or No Shot. David Kaplan and Jordan Cornette talk with Jesse Rogers. The guys also break down the National Championship game. David Kaplan, Eddie Olczyk and Jordan Cornette talk with Cubs VP & GM Jed Hoyer. David Kaplan, Eddie Olczyk and Jordan Cornette talk with Jesse Rogers. They also play Shot or No Shot. David Kaplan, Eddie Olczyk and Jordan Cornette talk with Cubs owner Tom Ricketts. Live from Buffalo Wings and Rings Kap and Jordan talk with White Sox PBP Jason Benetti. Then the guys replay their interview with Rick Hahn. Kap and Jordan are live from Buffalo Wings & Rings. They're joined by White Sox GM Rick Hahn, and talk about the Cubs struggles. David Kaplan and Jordan Cornette talk with Tom Verducci and Texas Tech head coach Chris Beard. David Kaplan and Jordan Cornette talk with Jeff Passan and play Shot or No Shot. David Kaplan and Jordan Cornette talk about the Cubs 1-4 start. They also talk with Jesse Rogers. David Kaplan and Pat Boyle play Shot or No Shot and they talk about the Cubs issues early in the season. David Kaplan and Pat Boyle talk with Michigan State head coach Tom Izzo and Doug Glanville. David Kaplan and Pat Boyle talk about the issues with the Cubs as they start the season 1-3. David Kaplan talks with Jeff Dickerson. David Kaplan talks with Cubs first baseman Anthony Rizzo. Kap also plays Shot or No Shot. David Kaplan talks with Jesse Rogers. David Kaplan and Jordan Cornette talk with Jay Bilas and Seth Greenberg. David Kaplan talks with Cubs pitcher Kyle Hendricks and The Philly Godfather. David Kaplan talks with Frank Thomas and Jesse Rogers. David Kaplan talks with Patrick Finley and he plays Shot or No Shot. David Kaplan and Jordan Cornette talk with Fran Fraschilla. David Kaplan and Jordan Cornette talk with Jesse Rogers and Chuck Garfien. David Kaplan and Jordan Cornette talk about the start to the MLB season! They also play Shot or No Shot. David Kaplan talks with Bernie Miklasz and Jon Scheyer. David Kaplan talks with Brian Hamilton and Bart Winkler. David Kaplan talks with Patrick Mooney. David Kaplan and Jordan Cornette talk about Mitch Trubisky's chances to win MVP. David Kaplan and Jordan Cornette talk with Michigan State head coach Tom Izzo and Cubs first baseman Anthony Rizzo. David Kaplan and Jordan Cornette talk with Vincent Goodwill and play Shot or No Shot. David Kaplan and Jordan Cornette talk about Duke getting to the Sweet 16. Would Zion Williamson on the Bulls have more impact than Derrick Rose? David Kaplan talks with Dan Dakich and Jesse Rogers. David Kaplan talks with Jordan Cornette. David Kaplan and Pat Boyle talk with Steve Lavin and The Philly Godfather. David Kaplan and Pat Boyle get ready for the NCAA Tournament and they play Shot or No Shot. David Kaplan and Jordan Cornette talk with Brian Hamilton. David Kaplan and Jordan Cornette talk about Mike Trout's new contract and they play Shot or No Shot. David Kaplan and Jordan Cornette talk with Michigan State head coach Tom Izzo and Mel Kiper Jr.
David Kaplan and Jordan Cornette talk NCAA hoops and the Bulls win last night over the Suns. They also play Shot or No Shot. David Kaplan talks with Jay Bilas and Jesse Rogers. David Kaplan talks with Jordan Cornette and Malika Andrews. David Kaplan talks about Selection Sunday and the brackets for March Madness. He also plays Shot or No Shot. Chris and Jonathan talk about the newest Bears and how they stack up versus the NFC. Then things get weird in Tales From The Hood. Chris and Jonathan talk about what strides the Bulls have made and what to expect from them next season. Then Nick Friedell joins to talk GSW and NBA. Chris Bleck and Jonathan Hood discuss the Bears newest acquisitions and Zion's electric return last night. Then Jesse Rogers joins for a Cubs update. Jonathan Hood sits in for David Kaplan and talks with Sean Farnham and Kendall Gill. Jonathan Hood sits in for David Kaplan and he plays Shot or No Shot and has the top stories of the day in Tales From The Hood. Jonathan Hood sits in for David Kaplan and talks with Jesse Rogers. David Kaplan and Jordan Cornette talk with Jesse Rogers and they play Shot or No Shot. David Kaplan and Jordan Cornette talk with Dan Graziano. David Kaplan and Jordan Cornette talk with Chris Mortensen. David Kaplan and Pat Boyle talk about the latest free agency news in the NFL. They also played Shot or No Shot. David Kaplan and Pat Boyle talk with Jeremy Fowler. David Kaplan and Pat Boyle talk with Dan Wiederer. David Kaplan talks about the latest in NFL Free Agency. David Kaplan talks with Patrick Mooney and he plays Shot or No Shot. David Kaplan talks with Dan Dakich and reacts to the news of Antonio Brown being traded to Oakland over the weekend. David Kaplan talks with Tim Kurkjian and Fran Fraschilla. David Kaplan talks with Field Yates and Emily Kaplan. David Kaplan talks about the Bears options to move Jordan Howard this off-season. David Kaplan and Pat Boyle talk with Eddie Johnson. David Kaplan and Pat Boyle talk with Malika Andrews and Dan Graziano. David Kaplan and Pat Boyle talk about the Bulls win over the 76ers and they play Shot or No Shot. David Kaplan and Jordan Cornette talk with Jesse Rogers. They also play Shot or No Shot. David Kaplan and Jordan Cornette talk with Frank Isola. David Kaplan and Jordan Cornette talk about legalized sports gambling. David Kaplan and Jordan Cornette talks with Dan Wiederer. They also talk about the direction of the Chicago Bulls. David Kaplan talks with Jeff Van Gundy and plays Shot or No Shot. David Kaplan talks with Jesse Rogers and Matt Bowen. David Kaplan talks with Tom Haberstroh about the Bulls, LeBron James and the issues with the Boston Celtics. David Kaplan and Jonathan Hood talk with Amin Elhassan and played Shot or No Shot. David Kaplan and Jonathan Hood talk with David Ross and Chris Mortensen. David Kaplan and Jonathan Hood talk with Pedro Gomez. David Kaplan talks about kids sports and how much playing time should a kid get on a travel sports team. David Kaplan talks with Cubs first baseman Anthony Rizzo and Dan Orlovsky. David Kaplan talks with Dan Wiederer. He also talks about the Bears and the Bulls win over the Grizzlies last night. David Kaplan talks about if the Cubs should sign Kris Bryant to an extension this off-season. David Kaplan talks with Jesse Rogers and listens to Bears GM Ryan Pace meeting the media at the NFL Combine. David Kaplan talks with Dan Wiederer from the Chicago Tribune. David Kaplan and Jordan Cornette talk with Jesse Rogers and Charles Davis. David Kaplan and Jordan Cornette talk with Malika Andrews and play Shot or No Shot. David Kaplan and Jordan Cornette talk with Adam Schefter. David Kaplan talks with Jeff Passan and Alex Kennedy. David Kaplan talks with Bulls head coach Jim Boylen. He also plays Shot or No Shot. David Kaplan hears from Manny Machado who is introduced to the San Diego media. The guys also play Shot or No Shot. David Kaplan talks with Eddie Olczyk. David Kaplan talks with Jesse Rogers. He also hears some of the best audio from the NBA last night. David Kaplan and Pat Boyle talk about why the White Sox didn't land Manny Machado. David Kaplan and Pat Boyle talk with Jesse Rogers and Jay Bilas. David Kaplan and Pat Boyle talk about Zion Williamson and play Shot or No Shot. David Kaplan talks with Chris Russo and Jesse Rogers. David Kaplan talks with White Sox VP & GM Rick Hahn following Manny Machado signing with the San Diego Padres. David Kaplan talks with Dan Plesac and Rick Hahn. David Kaplan talks about the fallout following Manny Machado signing with the San Diego Padres. David Kaplan and Jordan Cornette talk about the breaking MLB news of Manny Machado signing with the San Diego Padres. David Kaplan and Jordan Cornette talk with Cubs pitcher Brian Duensing and they play Shot or No Shot. David Kaplan talks about the Cubs off-season and listens in to Tom Ricketts press conference live in Arizona. David Kaplan talks with Marc Ganis and Jesse Rogers. David Kaplan talks about the latest MLB rumors for Manny Machado and Bryce Harper. He also plays Shot or No Shot. David Kaplan talks with Jesse Rogers and Chuck Garfien. David Kaplan talks with Chris Getz and Kelly Crull. David Kaplan talks with Cubs left fielder Kyle Schwarber. He also plays Shot or No Shot. David Kaplan talks with Crane Kenney and Kyle Hendricks. David Kaplan talks with Jesse Rogers and plays Shot or No Shot. David Kaplan talks with Michael Kopech and Ryan Dempster. David Kaplan talks with Rece Davis and plays Shot or No Shot. David Kaplan talks with Cubs third baseman David Bote. David Kaplan and Jesse Rogers talk with Jim Thome. David Kaplan and Jesse Rogers talk with Dan Wiederer and they play Shot or No Shot. David Kaplan and Jesse Rogers talk with Pedro Gomez. David Kaplan talks with Jesse Rogers and Brian Windhorst. David Kaplan talks with Cubs VP GM Jed Hoyer as the Cubs report to Spring Training. The guys talk about Yu Darvish, Kris Bryant and expectations from the fan base. David Kaplan talks with Jason McLeod and Jed Hoyer. David Kaplan talks with Julian Green VP of Communications from the Chicago Cubs. He also plays Shot or No Shot. The guys debate what the level of trust the Bulls fans should have in this front office. Chris, Adam and Jason are in for Kap. They break down GarPax's press conference yesterday, and discuss all the moves from NBA's trade deadline. Charles Davis joins the guys to discuss the dominance of the Patriots, and the play a little Shot or No Shot. Malika Andrews discusses the latest Bulls trade, and Tim Kurkjian has the latest MLB news. Chris Bleck and Fred Huebner break down the Bulls trade from last night, and Nick Friedell discusses Kevin Durant's comments. Chris Bleck and Pat Boyle are in for Kap as they: debate how to fix MLB, talk NBA trade deadline w/Frank Isola and Joe Ricketts' emails w/Adam Abdalla. Chris and Jordan play shot or no shot. Then they discuss if Harden can keep up this pace and if Machado is playing the White Sox. Chris and Jordan are joined by John Fox to put a bow on the NFL season. Then Ramona joins to break down the Anthony Davis rumors. Chris Bleck and Jordan Cornette compare Brady's greatness to other greats in other sports. Plus Jon Greenberg joins to talk about Ricketts' controversial emails. David Kaplan and Pat Boyle talk with Carmen and Jurko. David Kaplan and Pat Boyle talk with Dan Wiederer and The Philly Godfather. David Kaplan and Pat Boyle talk to Lindsey Thiry to preview the Super Bowl. David Kaplan and Pat Boyle talk with Jeff Passan and Charles Davis. David Kaplan and Pat Boyle talk about Roger Goodell's press conference yesterday at the Super Bowl. David Kaplan talks with Tom Waddle. David Kaplan talks with Dan Orlovsky and Amin Elhassan. David Kaplan talks with Bobby Marks. David Kaplan and Jordan Cornette play The Game with Carmen and Jurko. David Kaplan and Jordan Cornette talk with John Fox and Malika Andrews. David Kaplan and Jordan Cornette talk with Stan Van Gundy. David Kaplan and Eddie Olczyk talk with Carmen and Jurko. David Kaplan and Eddie Olczyk talk with Rick Hahn, Kendall Coyne and Adam Schefter. David Kaplan and Eddie Olczyk talk about the breaking news of Anthony Davis saying he wants to be traded from New Orleans. David Kaplan talks with Eddie Olczyk and is joined by Carmen and Jurko during Cross Talk. David Kaplan talks with Vincent Goodwill and Tracy Butler. David Kaplan talks about George McCaskey's interview on Waddle and Silvy. David Kaplan and Pat Boyle talk with AJ Pierzynski. David Kaplan and Pat Boyle listen to Chuck Pagano's introductory press conference. They also talk with Charles Davis. David Kaplan and Pat Boyle talk with Dan Wiederer and play Shot or No Shot. David Kaplan and Jordan Cornette talk about ideas to change the NFL overtime rules. They also Cross Talk with Carmen and Jurko. David Kaplan and Jordan Cornette talk with Dan Orlovsky. David Kaplan and Jordan Cornette talk with Jay Bilas. They also play Shot or No Shot. David Kaplan and Jordan Cornette talk with Jeff Saturday, Tom Verducci and Bobby Marks. David Kaplan and Jordan Cornette talk about the fallout over the blown call in the NFC Championship game. They also play Shot or No Shot. David Kaplan and Jeff Dickerson talk about Mitch Trubisky being added to the Pro Bowl roster. They also talk with Carmen and Jurko. David Kaplan and Jeff Dickerson talk with Jesse Rogers and Adam Schefter. David Kaplan and Jeff Dickerson talk about the Super Bowl. They talk about the Rams and Patriots moving on to Atlanta. They also play Shot or No Shot.